THESE words constitute the very brief preface which the writer thought sufficient for the earliest ecclesiastical history ever produced in the Church of God. Let us imitate him in his brevity and conciseness, and without further delay enter upon the consideration of a book which raises vital questions and involves all-important issues. Now when a plain man comes to the consideration of this book one question naturally strikes him at once: How do I know who wrote this book, or when it was written? What evidence or guarantee have I for its authentic character? To these questions we shall apply ourselves in the present chapter. But then, some one might say, how do we know that the genuine Acts of the Apostles existed prior to the Acts of Paul and Thecla and the time of Tertullian, who first mentions these apocryphal Acts, and tells us of their forged origin? The answer to that query is easy enough. Yet it will require a somewhat copious statement in order to exhibit its full force, its convincing power. Tertullian is a writer who connects the age of apostolic men, as we may call the men who knew the Apostles—Ignatius, Polycarp, Clement of Rome, and such like—with the third century. Tertullian was born about the middle of the second century, and he lived till the third century was well advanced. He was one of those persons whose chronological position enables them to transmit historical facts and details from one critical point to another. Let me illustrate what I mean by a modern example. Every unprejudiced thinker will acknowledge that the Rev. John Wesley was a man who exercised an extraordinary religious influence. He not only originated a vast community of world-wide extent, which calls itself after his name, but he also imparted a tremendous impetus to spiritual life and work in the Church of England. After the departure of Mr. Wesley from this life his mantle fell upon a certain number of his leading followers, men like Adam Clarke, the commentator; Jabez Bunting, the organiser of modern Wesleyanism; Thomas Coke, Robert Newton, and Richard Watson, the author of the "Institutes of Theology." Several of these men lived far into this century, and there are at the present day thousands still alive who recollect some of them, while there are many still alive who can recollect all of them. Now let us draw a parallel with all reverence, and yet with perfect fairness. John Wesley began his life at the beginning of the eighteenth century as our Lord began His human life at the beginning of the first century. John Wesley’s immediate disciples perpetuated their lives till the middle of the present century. Our Lord’s apostles and immediate followers perpetuated their lives in some cases till well into. the second century. At the close of the nineteenth century there are hundreds, to say the least, who remember Adam Clarke and Thomas. Coke, who in turn were personally acquainted with John Wesley. In the last quarter of the second century there must have been many still alive—apostolic men, I have called them—whose youthful memories could bear them back to the days when the Apostle St. John, and men like St. Mark, and St. Luke, and St. Ignatius, still testified what they had personally seen and heard and known. Why, the simple fact is this, that in the year 1950 there will be still living numerous persons who will be able to say that they have personally known many individuals who were the friends and acquaintances of John Wesley’s immediate disciples. Four long lives of ninety years, and one overlapping the other, will easily cover three centuries of time. Tertullian must have had ample means, then, of ascertaining the facts concerning the books of the New Testament from living witnesses. There is again another point we must bear in mind, and it is this: the distance of time with which Tertullian’s investigations had to deal was not so vast as we sometimes imagine. It was by no means so great as the spaces we have just now referred to. We naturally think of Tertullian as living about the year 200, and then, remembering that our Saviour was born just two centuries before, we ask, What is the value of a man’s testimony concerning events two centuries old? But we must bear in mind the exact point at issue. We are not inquiring at all about events two centuries old, but we are inquiring as to Tertullian’s evidence with respect to the canonical Gospels and the Acts; and none of these was one hundred years old when Tertullian was born, about 150 A.D., while the Gospel of St. John may not have been more than sixty years old, or thereabouts, at the same date. Now if we take up the writings of Tertullian, which are very copious indeed, we shall find that the Acts of the Apostles are quoted at least one hundred times in them, long passages being in some cases transcribed, and the whole book treated by him as Scripture and true history. If we accept the ordinary view, that the Acts were written previously to St. Paul’s death, the book was only a century old at Tertullian’s birth. But we can come nearer to the apostolic times. The Muratorian fragment is a document which came to light by chance one hundred and fifty years ago. It illustrates the age of the Acts, and shows what wondrous testimonies to the New Testament scriptures we may yet gain. Its story is a very curious and interesting one for ourselves. St. Columbanus was an Irish missionary who, about the year 600 A.D., established a monastery at Bobbio, a retired spot in North Italy. He gathered a library there, and imparted a literary impulse to his followers which never left them.13 Some Irish monk, a hundred years later than Columbanus, employed his time in copying into a book an ancient manuscript of the second century giving a list of the books of the New Testament then received at Rome. This second-century manuscript enumerated among these the four Gospels, the Acts of the Apostles, and thirteen Epistles of St. Paul. Concerning the Acts of the Apostles, the Roman writer of this document, who lived about A.D. 170, Says: "The Acts of all the Apostles are written in one book. Luke explains to the most excellent Theophilus everything which happened in his presence, as the omission of Peter’s martyrdom and of Paul’s journey into Spain manifestly proves"; a passage which clearly shows that about the middle of the second century the Acts of the Apostles was well known at Rome, and its authorship ascribed to St. Luke.14 But this is not all. Wee have another most interesting second-century document, which proves that at the very same period our canonical book was known and authoritatively quoted far away in the south of France. It is hard to exaggerate the evidential value of the Epistle of the Churches of Lyons and Vienne written about the year 177, and addressed to their brethren in Asia Minor. That letter quotes the books of the New Testament in the amplest manner, and without any formal references, just as a modern preacher or writer would quote them, showing how common and authoritative was their use. Leader-writers in the Times or the Sunday Review often garnish their articles with a scriptural quotation; the late Mr. John Bright, in his great popular orations, loved to point them with an apt citation from Holy Writ; but he never thought it necessary, nor do journalists ever think it necessary, to prefix a formal statement of the place whence their texts have been derived. They presume a wide knowledge and a formal recognition of the text of the Bible. So it was in this epistle written from Lyons and Vienne, and in it we find an exact quotation from the Acts of the Apostles—"According as Stephen the perfect martyr prayed, Lord, lay not this sin to their charge." But this is not the whole of the argument which can be derived from the Epistle of the Lyonnese Christians, which is given to us at full length in the fifth book of the "Church History" of the celebrated historian Eusebius. Their incidental notice of the Acts involves a vast deal when duly considered. The Epistle from Lyons implies that the Acts were received as authoritative and genuine in the churches of towns like Ephesus, Philadelphia, Smyrna, Miletus, where the memories and traditions of the Apostles were still vivid and living. Then, too, the Bishop of Lyons had suffered in this persecution. His name was Pothinus. He was the first Bishop of the Church of Lyons, and he died when he was more than ninety years of age, and may have been a disciple of an apostle, or of one of the first generation of Christians. At any rate, his memory would easily carry him back to the days of Domitian and the times of the first century; and yet the Church over which this first-century Christian presided accepted the Acts of the Apostles. The testimony of Pothinus helps then to carry back the Acts of the Apostles to the year 100 at least. But we can go farther still, and closer to apostolic times. The Gospel of St. Luke and the Acts of the Apostles are, we may say, universally admitted to be by the same writer. The reference of the Acts to the Gospel, the unity of style and tone of thought, all demonstrate them to be the production of one mind. Any circumstance therefore which proves the early existence of the Gospel equally proves the existence of the Acts of the Apostles. Now we have proof positive that the Gospel of St. Luke occupied an authoritative position and was counted an apostolic and sacred writing at Rome in the early years of the second century, say between too and 150, because when Marcion, whom we might call a primitive Antinomian, wished to compile a gospel suited to his own purposes, he took St. Luke s Gospel, cut out whatever displeased him, and published the remainder as the true version. The perversion and mutilation of St. Luke’s work show that it must already have held a high position in the Church at Rome, or else there would have been no object in mutilating it. Marcion’s treatment of St. Luke proves the use and position the Gospel and the Acts must have occupied in days when the converts and companions of the Apostles were still alive.15 That is as far as we can go back by external testimony. But then we must remember what these facts involve—that the Gospel and the Acts occupied authoritative positions in various parts of the world, and specially in Rome, Gaul, Africa, and Asia Minor, in the generation next after the Apostles. Then let us take up the Book of Acts itself, and what does this book, known at Rome and throughout the Christian world at that early period, tell us? It informs us that it was the work of the writer of the Gospel, and that the writer was a companion of the Apostle Paul throughout the portion of his career sketched in the latter part of the book. The Christian Church has never pinned its faith to the Lukian authorship of either the Gospel or the Acts. The question of the authorship of these books is an open one, like that of the Epistle to the Hebrews. The Acts has been attributed to Silas, to Timothy, to Titus; but I may say, without going into any further details on this question, that every attempt to ascribe the Acts to any one else save to the beloved physician has failed, and must fail, because he was the real author, well known to the living tradition of the Church of Rome in the early part of the second century, as that tradition is handed down to us in the language at the Muratorian Fragment. If we were writing a critical treatise, we should of course have to enter upon the full discussion of many questions which might here be raised. The Acts of the Apostles in its latter chapters plainly claims to be the work of an eye-witness. In its opening words, placed at the head of this dissertation, it claims to be the work of the author of the Gospel. All the facts fall into a simple, natural order if we accept the traditional testimony of the Church that the Acts and the Gospel were both of them written before the martyrdom of St. Paul, and were indited by the hands of St. Paul’s companion St. Luke. Any other solution is forced, unnatural, and involves inconsistencies on every side. We may turn aside from this brief outline of the critical question, to some more purely spiritual reflections, simply referring those who desire more information on the questions of date and authorship to such exhaustive works as those of Dr. Salmon’s "Introduction to the New Testament"; Dr. Westcott on the "New Testament Canon"; Dr. Charteris on "Canonicity," or Meyer’s "Introduction to the Acts." First, then, it may strike the intelligent reader, how comes it that we have not much fuller testimony in early Christian writers to the Acts of the Apostles, and to all the books of the Old Testament? How is it that the writings of Polycarp, Ignatius, Clement of Rome, do not abound with references, not merely to the Acts, but also to the four Gospels and to the other works of the New Testament? How is it that we have to depend on this obscure reference and that dubious quotation? These are questions which had often puzzled my own mind before I had investigated, and must often have raised anxiety and thought in other minds sincerely desirous of being rooted and grounded in the truth. But now, after having investigated and thought, I think I can see solid reasons why things are as they are; clear evidences of the truth of the Christian story in the apparent difficulties. Historic imagination is one of the necessary requisites in such an investigation, and historic imagination is one of the qualities in which our German cousins, from whom most of the objections to the canon of the New Testament have been derived, are conspicuously deficient. They are gifted with prodigous industry, and an amazing capacity for patient investigation. They live secluded lives, however, and no one is a worse judge of practical life, or forms wilder conclusions as to what men actually do in practical life, than the academic pure and simple. A dear friend, now with God, himself a distinguished resident of a well-known college, used often to say to me, "Never trust the opinion of a mere college fellow or professor upon any practical point; they know nothing about life." This dictum, begotten of long experience, bears on our argument. German thought and English thought offer sharp and strong contrasts on many points, and on none more than in this direction. English students mix more in the world, are surrounded by the atmosphere of free institutions, and realise more vividly how men spontaneously act under the conditions of actual existence. The German thinker evolves his men of the past and the facts of their existence out of his own consciousness, without submitting them to the necessary corrections which experience dictates to his English brother; and the result is that while we may be very ready to accept the premises of the Germans, we should be in general somewhat suspicious of their conclusions. Scholarship alone does not entitle a man to pronounce on questions of history. It is only one of the elements requisite for the solution of such problems. Knowledge of men, experience of life, enabling a man to form a just and true mental picture of the past and of the motives by which men are influenced, -these are elements equally necessary. Now let us try and throw ourselves back by an effort of historical imagination into the age of Polycarp, Ignatius, and Clement of Rome. and I think we shall at once see that the omission of such abundant references to the New Testament as men at times desiderate was quite natural in their case. The canon of the New Testament grew up by degrees, somehow thus. While the Apostles and their followers and the friends of their followers lived and flourished, men naturally sought after their living testimonies, consulting doubtless such documents as well which lay within their reach. But when the living witnesses and their friends had passed away, the natural instinct of the Church, guided by that Spirit of Truth which in the darkest times has never wholly left Christ’s Spouse, led her to treasure up and dwell with greater love upon those written documents which she had possessed from the beginning. It is no wonder, then, that we do not find large quotations and copious references to the canonical books in the earliest writers—simply because it was impossible they should then have occupied the same place in the Christian consciousness as they now do. Rather, on the contrary, we should be inclined to say that, had they been largely quoted and frequently referred to by Polycarp, Ignatius, or Clement, men might naturally have derived therefrom a forcible argument against the genuine character of the works of these primitive Fathers, as such quotations would have been contrary to the principles of human nature. It is very important for us to remember these facts. They have a very clear bearing upon present-day controversies. Friends and foes of Christianity have often thought that the truth of our religion was bound up with the traditional view of the canon of the New Testament, or with some special theory of inspiration; forgetting the self-evident truth that Christianity existed at the beginning without a canon of the New Testament, that the early Christians depended upon personal testimony alone, and that if the Apostles and their friends had never written a line or left a solitary document behind them, yet that we should have abundant information concerning the work and teachings of our Lord and His Apostles in the writings of the successors of the Apostles, compared with and fortified by contemporaneous pagan testimony. Men have sometimes thought and spoken as if the New Testament descended from-heaven in its present shape, like the image that fell down from Jupiter which the Ephesians worshipped, forgetting the true history of its upgrowth and origin. The critical theories that have been advanced in abundance of late years would have troubled a second-century Christian very little. If the Johannine authorship of the fourth Gospel were denied, or the Pauline authorship of Colossians or Ephesians questioned; what does it matter? would have been his reply. These documents may have been forgeries, but there are plenty of other documents which tell the same story, and I have myself known many men who have suffered and died because they had embraced the truths, from the lips of the Apostles themselves, which they have taught me. The simple fact is, that if all the books of the New Testament were proved impudent forgeries except the Epistle to the Romans, the two Epistles to the Corinthians, and the Calatians, which every person admits, we should have ample and convincing statements of Christian truth and doctrine. The devout Christian may, then, make his mind easy, certain that no efforts and no advances in the field of biblical criticism are likely to ruffle even a feather of the faith once delivered to the saints. But then, some one may come forward and say, is not this a very uncomfortable position for us? Would it not have been much more easy and consoling for Christians to have had the whole canon of Scripture infallibly decided by Divine authority once for all, so as to save all doubts and disputations on the whole subject? Would it not have been better had the Acts of the Apostles expressly named St. Luke as its author, and appended ample proofs that its statement was true? This objection is a very natural one, and springs up at times in every mind; and yet it is merely part and parcel of the larger objection, Why has Revelation been left a matter of doubt and disputation in any respect? Nay, it is part of a still wider and vaster question, Why has truth in any department, scientific, philosophical, ethical, or historical, been left a matter of debate? Why has it not shone forth by its own inherent light and compelled the universal consent of admiring mankind? Why has not the great fundamental truth of all, the existence and nature of God, been made so clear that an atheist could not possibly exist? A century and a half ago Bishop Butler, in his immortal "Analogy," disposed of this objection, which still crops up afresh in every generation as if that work had never been written.18 God has placed us here in a state of probation, and neither in temporal nor in spiritual matters is the evidence for what is true, and right, and wise so clear and overwhelming that no room is left for mistake or error. As it is in every other department of life, so is it especially with reference to the canon of Scripture. It would doubtless be very convenient for us if the whole question were settled authoritatively and no doubts possible, but would it be good for us? would it be wholesome for our spiritual life? I trow not. We have, indeed, a living and speaking example of the blessings of uncertainty in the state of the Roman Catholic Church, which has tried to better the Divine method of training mankind, and banish all uncertainty. That communion undertakes to settle infallibly all questions of theology, and to leave nothing in doubt; and with what result? The vast body of the laity take no interest whatsoever in theological questions. They regard theology as outside their sphere, and belonging to the clergy exclusively. The clergy in turn believe that the Pope, in his office of infallible and universal pastor and teacher, has alone the right and authority to settle doctrines, and they leave it to him. They have made a solitude, and that they call peace, and the pretence alone of an authority which undertakes to release man from doubt and the need of investigation has paralysed theological inquiry among Roman Catholics. And if our fate be death, give light and let us die." The thoughts with which we have hitherto dealt connect themselves with the opening words of the text with which we have begun this chapter, "The former treatise I made, O Theophilus." There are two other points in this passage which are worthy of devout attention. The writer of the Acts took a thoroughly historical view of our Lord’s life after the resurrection as well as before that event. He considered that our Lord’s person, no matter how it may have been modified by His death and resurrection, was still as real after these events as in the days when He ministered and wrought miracles in Galilee and Jerusalem. His Whole life was continuous, from the day of the birth in Bethlehem "until the day He was taken up." Then again St. Luke recognises the dual personality of our Lord. As we shall afterwards have frequently to notice, St. Luke realised His Divine character. In the opening verses of this book he recognises His complete and perfect humanity—"After that He had given commandment through the Holy Ghost unto the Apostles." There was an ancient heresy about the nature of our Lord’s person, which denied the perfection of our Lord’s humanity, teaching that His Divinity took the place of the human spirit in Christ. Such teaching deprives us of much comfort and instruction which the Christian can draw from a meditation upon the true doctrine as taught here by St. Luke. Jesus Christ was God as well as man, but it was through the manhood He revealed the life and nature of God. He was perfect Man in all respects, with body, soul, and spirit complete; and in the actions of His manhood, in the exercise of all its various activities, He required the assistance and support of the Holy Ghost just as really as we ourselves do. He taught, gave commandments, worked miracles through the Holy Ghost. The humanity of the Eternal Son required the assistance of the Divine Spirit. Christ sought that Divine aid in prolonged communion with His Father and His God, and then went forth to work His miracles and give His commandments. Prayer and the gift of the Spirit and the works and marvels of Christ were closely connected together, even before the open descent of the Spirit and the wonders of Pentecost. There was a covenant blessing and a covenant outpouring of the Spirit peculiar to Christianity Which was not vouchsafed till Christ had ascended. But the Divine Spirit had been given in a measure long before Christ came. It was through the Spirit that every blessing and every gift came to patriarchs, prophets, warriors, teachers, and workers of every kind under the Jewish dispensation. The Spirit of God came upon Bezaleel and Aholiab, qualifying them to work cunningly for the honour and glory of Jehovah when a tabernacle was to be feared. The Spirit of God came upon Samson, and roused his natural courage when Israel was to be delivered. The Spirit of God could rest even upon a Saul, and convert him for a time into a changed character. And just as really the Holy Ghost rested upon the human nature of Jesus Christ, guiding Him in the utterance of those commandments, the outcome and development of which we trace in the book of the Acts of the Apostles. See a copious account of this strange second-century forgery in Dr. Gwynne's article on Thecla in the fourth volume of the Dictionary of Christian Biography . Dr. Salmon, in his Introduction to the N.T. , chap. 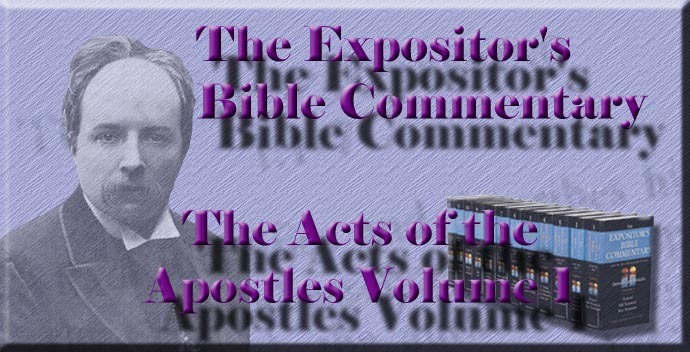 xix., gives a most interesting description of the apocrypha Acts of the Apostles, which even the unlearned can enjoy. The Irish people are very Oriental in the tenacity with which they retain ancient traditions, transmitting them intact to posterity. Abundant instances have proved this, the traditions having been perpetuated in some cases for five hundred years or more. The following case has come under the writer's notice in his own neighbourhood. There is near Dublin a village called Finglas, celebrated for its ancient Abbey. A cross stood there which had been venerated from the earliest times. When Cromwell's soldiers were advancing to attack Dublin about the year 1648, their iconoclastic fame reached the inhabitants of Finglas, who took the ancient cross and buried it in one of the glebe fields. Some one hundred and sixty years later a vicar of Finglas of antiquarian tastes heard traditions of this event. He learned from an extremely old man that his grandfather when a boy had been present at the burial of the cross, and had shown him the spot where it was concealed. The vicar made excavations, and duly found the cross, which he re-erected some time about 1810, in a spot where it is still to be seen. This instance will show how two long lives could cover the space between St. Paul's middle age and Tertullian's mature years. See Fingal and its Churches , by Rev. R. Walsh, D.D., pp. 147-49. Dublin, 1888. St. Jerome, De Vir. Illust. , 53, mentions a similar case in his time. St. Jerome knew an old man who when young had himself known one of St. Cyprian's secretaries. St. Jerome wrote about A.D. 400, St. Cyprian died in 257; the difference exactly between Tertullian and St. Paul. See two articles on St. Columbanus and his library in the Expositor for June and August 1889. Dr. Salmon, in his Introd. N.T. , pp. 48-54, describes the Muratorian Fragment. See Dr. Sanday's The Gospels in the Second Century , and Dr. Salmon's Introd. N.T. , pp. 204-208. The latest enquiries and discoveries confirm this view, which may be deduced from a study of the apostolic Fathers, with which should be compared the new second-century documents belonging to Ephesus and Rome discussed in Texte u. Untersuch . of Gebhardt and Harnack for 1888. Their titles are the tract De Aleatoribus , by Pope Victor I., and the Martyrdoms of Carpus and Papylus, Companions of St. Polycarp. Pope Victor gives a long extract from the Shepherd of Hermas , and calls it "Divine Scripture;" which shows that the canon was not closed at Rome in the last fifteen years of the second century. An interesting account of this second-century document will be found in the Texts , edited by Gebhardt and Harnack, or in the Dict. Christ. Biog. under "Scillitan Martyrs." Every scrap of second century evidence is of the greatest importance for biblical criticism. See Butler's Analogy , Part II., chap. vi. J. Keble, "The Sixth Sunday after Epiphany."